Will you get a great deal on a bank-owned home in Costa Rica? Is a $12,000 shipping container home your key to owning a vacation rental in Costa Rica? There are new condo buildings in the Central Valley everywhere. There is no zoning obligation for a certain amount of parking for every square foot of condo space built. 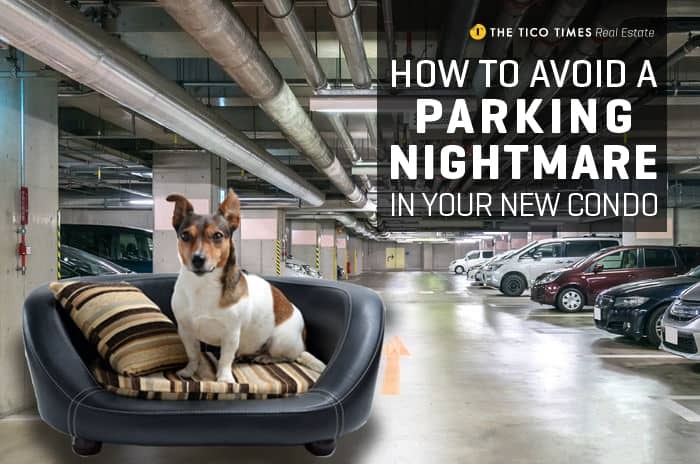 Pretty soon, we will have a parking nightmare in the new condos in Costa Rica. People who buy a condo in pre-construction often fail to consider how many parking spaces it has, and then they are unpleasantly surprised to find out it has only one. Real estate developers sometimes offer a 20 percent discount if you buy a condo in pre-construction, and the idea of flipping it may sound like a good way to make a quick buck. But what are you going to do when a two-car family of potential buyers shows up to look at your one-car condo? You’re going to watch them walk away, that’s what. A package deal that includes plenty of parking with a new condo in Costa Rica is not the norm. When you purchase a condo from a developer, the unit usually comes with only one parking space. Buying an extra parking space is possible, but that costs money. A parking spot usually measures about 15 square meters (just over 161 square feet), and I have seen real estate developers charge $10,000 for a parking space. That’s quite a bit of money to park a car. The market has changed a lot over the past 30 years. Single-family homes that were built 30 years ago came with a one-car garage. I’m talking about homes you will find in neighborhoods like Los Yoses, Dent, Rohrmoser, or in the downtown areas of Tibás and Guadalupe. Why? Because families 30 years ago had only one car. Today a middle-class family is far more likely to have more than one. Why buy a condo with only one parking spot? Costa Rica real estate developers are now building 1-bedroom condos, something we have never seen before. Single people, gay couples and couples without children are growing into a powerful market with plenty of money (or credit). Childless couples are much more likely to both have jobs, and to need two cars. So when a couple purchases a 1-bedroom new condo in Costa Rica, they are likely to need two parking spaces. Even if you buy a 3-bedroom condo, there is a good chance the property comes with only two parking spaces. So what happens when the kids grow up and get their own cars? Most buyers of a new condo in Costa Rica don’t even bother requesting a copy of the condo bylaws before they buy, which is another big mistake. Usually the condo bylaws state that visitor’s parking can only be used by visitors and for a certain amount of time. So what do you do when you have more cars than you are allowed? You will have to buy parking spaces for them or see if you can rent any. In large cities in other countries, many condo owners work in the same city they live in, and they use public transport to get around. I worked in Amsterdam for many years and most of my colleagues who lived in the city didn’t even own a car. In Costa Rica, we have the total opposite happening. Traffic jams are getting worse every day and parking is becoming a huge issue everywhere you go. In Europe and the States, many downtown condo buildings don’t even have parking in the condo. But there is public parking everywhere. Why do real estate developers not assist buyers better and recommend purchasing the right amount of parking in the condo? Because they do not plan enough parking and because they are afraid they will not sell enough parking spots. By the time reality hits the condo owners about the parking problem, the developer has moved onto the next project. In the permitting process of the construction of the condominium, there is no obligation as to the amount of parking to go with each condo. It is time that cities add parking in condominiums in their zoning requirements, just like they do when you request a business license for a restaurant. Most large cities in the United States and other countries have off-street parking regulations where they require one space per bedroom + 5 percent for visitors. Whether you buy a new condo in Costa Rica from a real estate developer or as a resale, make sure there’s enough parking. This will help you avoid a nightmare with the future resale of your condo. If you don’t need the parking you bought yourself, you’ll find it easy to rent it out to another condo owner who was not as smart as you were. Ivo Henfling founded the American-European Real Estate Group, the first functioning MLS in Costa Rica with affiliate agents from coast to coast, which has been in operation since 1999. Read his blog at https://www.american-european.net/Costa-Rica-Real-Estate-Blog or contact Ivo at (506) 2289-5125 / 8834-4515 or at ivo@american-european.net. Are traffic jams changing the Central Valley real estate market?